More cartoons in official PA paper, Fatah Facebook page, rejoice over kidnapping of three teenagers. In an odious distortion of the World Cup 2014 logo, the official Palestinian Authority daily printed Sunday a cartoon celebrating the kidnapping of three Israeli youths on Thursday night. Instead of the famous logo of the World Cup 2014, in which three victorious hands hold the globe, together creating the prestigious trophy, the PA cartoon shows a "trophy" of three hands holding three people with their hands up in surrender. Instead of the text "Brasil" below the "trophy," the word "Khalil" is written – Arabic for Hevron, a city near where the Israeli youths were kidnapped. Similarly, Fatah is celebrating the kidnapping as a victory. 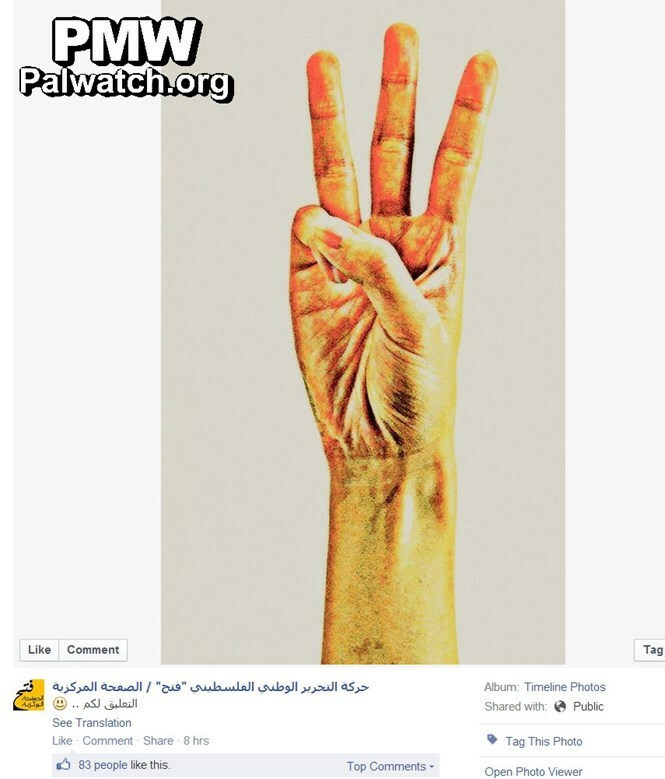 On its official Facebook page, the movement posted a cartoon of a victory sign with three fingers held up instead of two, symbolizing the three kidnapped youths. Accompanying the picture was a smiley with the text, "For your interpretation :)". The symbol may also be a play on the four-fingered gesture used by the Muslim Brotherhood in Egypt. Although Fatah has no links to the Brotherhood (Hamas is the Palestinian branch of the Muslim Brotherhood), the gesture became a popular and recognizable symbol among parts of the Arab world since the ouster of Egyptian Islamist President Mohammed Morsi. The cartoons were exposed by Palestinian Media Watch, an NGO dedicated to combating incitement in Palestinian Arab media. Earlier, Fatah's official Facebook page posted a cartoon comparing the three kidnapped Israeli students to rats. The post on the "Palestinian National Liberation Movement "Fatah" / Central Page" shows three rats with Stars of David dangling from a fishing rod; its implications are unmistakable. The sickening cartoon illustrates the mixed messages sent by the PA; on the one hand, Abbas promised to help Israel find the abducted teens – even as a senior PA official denied his administration would take any responsibility for the kidnappings.